Prominent among the carnivorous plants are the Pitcher Plants, whose leaves form tubes, or urns, or pitchers of various forms, which contain water, and to which insects are attracted and drowned. There is a very common pitcher plant in our northern bogs in whose urn-like leaves insects are found drowned, but which does not have such elaborate arrangements for their capture as other forms. Perhaps the most famous of the pitcher plants is one which is common throughout the Southern States. The leaves are shaped like slender hollow cones and rise in a tuft from the swampy ground. The mouth of this conical urn is over-arched and shaded by a hood in which are translucent spots like small windows. Around the mouth of the urn are glands which secrete a sweet liquid, and drops of this nectar form a trail down the outside of the urn. Inside, just below the rim of the urn, is a glazed zone so smooth that insects cannot walk upon it. Below the glazed zone is another zone thickly set with stiff downward-pointing hairs, and below this is the liquid in the bottom of the urn. If a fly is attracted by the nectar drops on this curious leaf, it naturally follows the trail up to the rim of the urn, where the nectar is abundant. If it attempts to descend into the urn it slips on the glazed zone and falls into the water, and if it attempts to escape by crawling up the side of the urn the thick-set downwardpointing hairs prevent. If it seeks to fly away from the rim it flies towards the translucent spots in the hood, which look like the way of escape, as the direction of entrance is in the shadow of the hood. Pounding against the hood, the fly falls into the water. This southern pitcher plant is known as a great fly-catcher, and is frequently used for this purpose in the South. The very largest of the pitcher plants is one which grows in the swamps of California, whose leaves sometimes become as much as two or three feet high, the huge pitchers forming the most capacious receptacle for insects of all kinds and sizes. Its general plan is like that of the southern pitcher plant described above, in that it has an overarching hood with translucent spots and a trail of nectar which leads to the dangerous rim. It has become further elaborated, however, in that the hood extends into a gaudy fish-like appendage, whose colors and flapping serve to attract the flying as well as the creeping insects. The pitcher, also, instead of being straight, is spirally twisted, and has a winglike expansion which serves as a guide in the spiral ascent to the rim, and leads the victim with definiteness and certainty to the region of danger. The fish-tail appendage is also smeared with the nectar secretion, so that any flying insect lighting upon it is enticed under the overshadowing arch and is almost sure of capture. The most common pitcher plants of the tropics are the Nepenthes, one of which is shown in our illustration. It will be noticed that each leaf when fully formed consists of three distinct regions, namely, the leaf-like blade, which is continued into a tendril which coils around a support, and the tendril in turn ends in a curiously formed pitcher, which has a more or less complete lid. These pitchers are often mottled with bright colors, and as they swing at the ends of the tendrils they seem to attract the attention of roving insects. Around the rim of the pitcher a very definite row of glands may be observed, which secrete the nectar to which the insects are attracted. The arrangements within the pitcher are such as have been described for the ordinary pitcher plant. 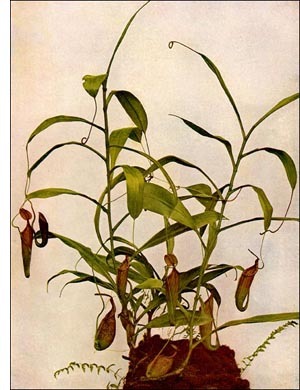 These pitchers of Nepenthes are usually found containing insects, and often very many of them, whose bodies are being slowly digested and the products absorbed by the plant.